We have the opportunity to show people that we can run a decent and civil legislative body and pass a strong legislative program for the American people. “Decent and civil” are important descriptors. At its best, our country has a collaborative two-party system. Let’s look forward to the restoration of decency and civility in public life. 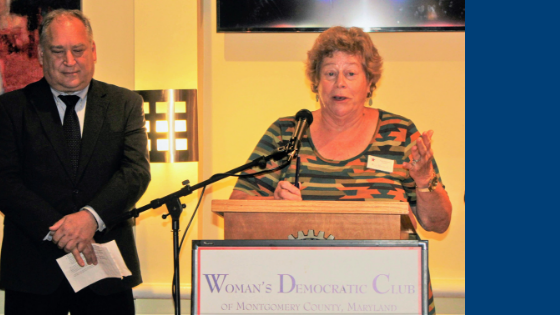 On that topic: Huge thanks to Kathleen Matthews, outgoing chair of MDDEMS, for the decency and civility she brought to her job as Party Chair, and to MDDEMS in general. And congratulations to incoming chair, Maya Rockeymoore Cummings. We look forward to working with Maya to build our party, register every eligible voter before 2020, and lay the groundwork for a Democratic governor in 2022. Personally, I was encouraged not only by the victories we won in November 2018, but also by the way we won those victories. To the credit of all involved, long-established organizations (such as WDC, the state and local party entities, and other traditional Democratic groups) and brand-new organizations (such as DoTheMostGood, JWalkers, MoCoWomen, and Indivisible Montgomery, and Progressive Action Montgomery) joined forces to achieve this historic win. Well done, all! Congratulations to the many WDC members, male and female, who won reelection. And special congratulations to those members who won election for the first time: Gabe Albornoz, Lorig Charkoudian, Charlotte Crutchfield, Evan Glass, Lesley Lopez, Sara Love, Will Jawando, Lily Qi, Emily Shetty, Karla Silvestre, Jared Solomon, and Brenda Wolff, as well as several new Central Committee members. And, of course to long-time WDC member Marc Elrich, our next County Executive. For those members who ran and were unsuccessful this time, start planning – 2018 was not the first campaign for several of this year’s winners. But, the work is never over. In the months ahead, WDC will conduct regular voter registration drives, work with our state legislative delegation on ways to improve things for women and our families, and continue educating ourselves and others about issues and challenges facing our county, our state, and our nation. Now is a great time to join a committee. Don’t forget: November 2020 is only 23 short months away.